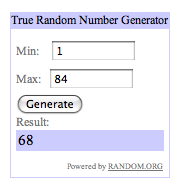 Using a random number generator I selected my two winners for the "please come like my Facebook page" give away. My Winners are Anderia Hu, and Sara Carmolingo Bloomfield. It was really fun to type in the names from Facebook into a spreadsheet. it was fun because I was amazed at who of my friends actually liked my art page (my husband was not on that list), and all the people I do not actually know. And then I learned that as a fan page, I cannot actually send messages to individuals, and since one of the winners isn't someone I know, I have to find her and send a message via my profile. So this is cool, I get to make a new friend! And if you think you have liked the page, do me a favor and double check. I have friends who helped me out and promoted my give away, but they themselves never clicked that "like" button.